The wonderful book bloggers at Mundie Moms asked me to be a part of the blog tour for Cynthia Hand's novel, Hallowed. This book is the follow-up to one of my favorite paranormal reads of 2011, Unearthly. Just when I thought this story couldn't have captured me more, Cynthia Hand took this next one to a whole new level! 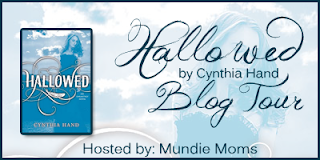 Thank you Mundie Moms for asking me to be a part of this blog tour and promote this fabulous book that every one needs to read! Cynthia Hand has done a superb job of taking the paranormal elements of angels and incorporating it with the every day life of a teenage girl. What drew me to her writing was how easily I was able to forget that Clara was an angel, with a purpose to fulfill. Her sarcastic, brave teenage self is what jumped off the pages at me. That feeling carried over in to Hallowed, accompanied with so many emotional blows that I was NOT prepared for. To view the complete list of bloggers for this tour, please visit Mundie Moms. Love your review. I was totally Team Tucker with Uneartly, but I've become Team Christian w/ Hallowed. I swear I should just be team in the middle. It's so hard to choose between the tour. Thank you so much for being on the blog tour! I've been anxiously waiting to find out what her decisions from last book have an effect on, I need to hurry up and read this one! Tissues galore were needed for Hallowed for sure. I can only imagine Book 3 will have much of the same! Still Team Tucker as well. Though I like Christian a lot more in this book. Great review. You're making me itch to read this series. I have like five books in front of it, but once I finish those this baby is in my hands. Well this and Unearthly! Be looking for my review?